Engelmann Oak, evergreen, unique elliptical leaves. Typically gets about 20 feet in about as many years, potential to 45 feet with adequate water in about 40 years. Plant at left is Baccharis sarothroides(broom baccharis), which makes a nice light green contrast to the brownish-green or dull green of the Engelmann Oak. Photo taken during winter, in Rancho Penasquitos. 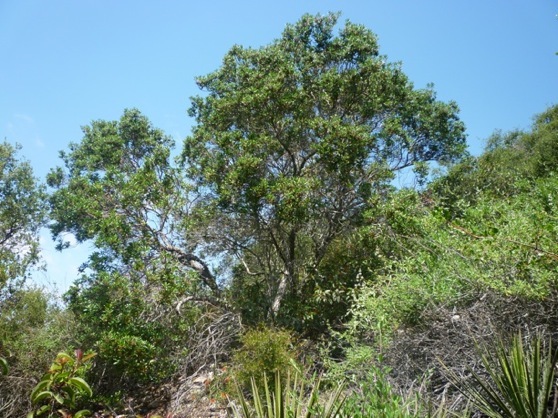 (Click underlined title to see more) Cercocarpus minutiflora, grows up to about 15 feet with adequate water. Top photo in San Clemente Canyon, aka Marian Bear Park. Coast Live Oak and California Sycamore in background. Artemisia californica and native white Morning Glory Vine(Calystegia macrostegia) in foreground. Grass around the trees at bottom. 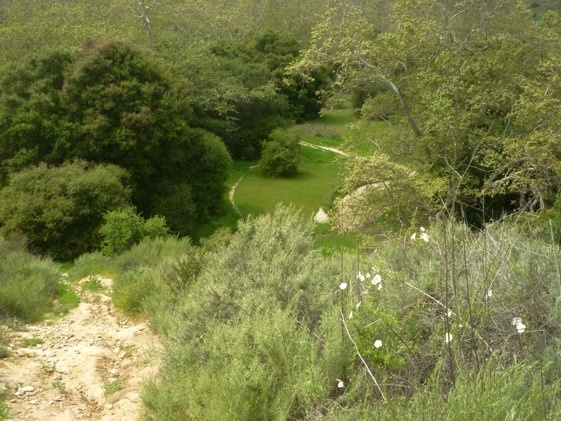 Both located in San Clementa Canyon, i.e. the 52 Freeway corridor between Clairemont and University City neighborhoods. (click on underlined title to see more)Mission Manzanita - Xylococcus, usually 6 to 10 feet in a couple or few decades, depending on the water; though potentially gets up to 15 to 18 feet with adequate water, but it might take several decades or more. Blooms in Winter. (click on underlined title to see more)Comarostaphylis div. div., closely related to Arbutus unedo, aka Strawberry Tree. Blooms in Spring, though can be a little earlier or later depending on the individual and location. With adequate water can grow up to about 15 to 20 feet, possibly more. Domesticated plants can grow at least 10 feet a decade with adequate water. Top photo also has Yucca schidigera front center and right, Cneoridium dumosum center between Com. (click on underlined title to read more info)Malacothamnus - Bush Mallow', Spring to early Summer bloomer in the wild, along with Viguiera to the right, top photo, at a garden done by Wes Hudson. Bottom photo, in the wild on Mt. Adenostoma fasciculatum(aka, Chamise, cream flowers) on right side, Erigonum fasciculatum(white, pink-tinged flowers) front center and to right, Eriophyllum confertiflorum(yellow flowers) front, Yucca schidigera at left between Salvia mellifera (in front) and Quercus dumosa (in back left, aka Scrub Oak), Xylococcus (Mission Manznita) back center, Salvia mellifera also at right side middle. In north Clairemont(neighborhood). (Click on underlined title to see more text)Yucca schidigera, potentially grows up 10 to 12 feet, but usually much less, 6 foot is average. Other plants in top photo, of the Yucca in bloom, are Lemonade berry in back, Artemisia californica in middle area, one Salvia mellifera intermingled a bit on left. Other plants in bottom photo are Lemonade berry to the left, Cholla cactus in center, Bladderpod at right. (Click on underlined title to see more) Bladderpod Bush, center, potential size to about 6'. Heaviest bloom in Spring, but some flowers scattered throughout the year. Top photo: Encelia(yellow sunflower) to the left, blooms in spring, potentially through Summer with irrigation. The darker bushes to the right are Lemonade Berry, and the grey-green bushes scattered in the background are probably Artemisia californica. (Click underlined title for more)In early spring on Cowles Mtn. Viguiera laciniata (yellow flowers), Artemisia californica (lite green-grey foliage), both of which are lite-woody shrubs, and Malosma laurina (Laurel Sumac) darker green big shrub in background, can be a big shrub to small tree, has real wood. Viguiera blooms mostly in Spring, though with irrigation can bloom most of the year.